Zeroids Begin! If you aren't already in Club Zeton, the very first Zeroids mold went on sale (and immediately sold out) tonight. A flesh-colored run was made for club members, and I have no doubt we'll be seeing more of it in the very near future. Click here to see the January 19 2016 Onell Design drop menu. Click here to order what's still available - at press time, it appears 11 of the 18 items remain. Here's a bit of a tangent - but not really. Marc Beaudette of Onell Design fame not only does some spiffy design work, but sells some swell music stuff over at Music ADD. I ordered a cassette from one of his projects and asked what else he could sell me - and he point me to this. The Macrotones put out this 12" record featuring layout work by Mr. Beaudette as well as Jesse "Callgrim/Rawhark" Moore cover art of some stupendously cool alien mammoth skull. Of course I ordered it. If you want one, click here. Twelve bones. A new drop! Click here for a tease. 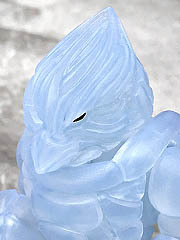 This is a new semi-translucent figure, and it'll be joined by... we don't know yet. Tuesday, January 19th at 9:30 PM Eastern will reveal (and I quote) "crossover action and a few surprises" so it's probably worthwhile to stay tuned. Me, I'm still hoping and praying for more Outer Space Men, but I'm hopeless. While shelf space and being realistic about dollars spent made me have to cut back from being all-in on the Granthans, I couldn't resist this Neo Granthan Gatorrior Mercenary. I loved getting the various wolves, and now that the gator-like alien is being done in Gruesome Gator colors? How can I possibly say no?